Vera & John Casino Review 2019 | Is This Online Casino Worth It? Vera&John Casino has one of the weirdest names you will find in the already weird and wacky world of online gaming, but don’t let that put you off from signing up with this imaginative site. The range of games is good, and the developers involved in providing slots games for this site dominate the market in terms of producing quality video slots. WHAT IS Vera & John Casino? Don’t be misled by the rather unusual name of this site as Vera&John Casino is very much a modern online betting site with a growing reputation in the industry. Founded in 2011, this is one casino which has been fast to embrace the merging between video gaming and online real money gaming, and the entertaining loyalty programme and regular tournaments available here give them an edge on the competition. You will find plenty of top titles from the best slot game providers in the business as well as a fully stocked live dealer casino at Vera&John. Vera&John Casino like to reward both new and existing clients, and while their welcome bonus may not be as flashy as you will find elsewhere it is actually a great deal for new players. For your first deposit of between £/$/€10 and £/$/€100 you will get a matched 100% bonus amount to use on the site. Pretty simple really, except there is the added advantage that at this casino your deposit and bonus funds are held separately. What this means is that if you wish to withdraw your deposit funds or any winnings you’ve made from your deposit then you can do so and will only lose the bonus amounts; a lot of casinos would remove your winnings as well as the bonus in that situation, so Vera&John are offering a pretty good deal. If you do start using the bonus funds then in order to withdraw them (or profits made using the bonus) you must wager the bonus amount 40 times on qualifying games first. The Loyalty Plan at Vera&John is one of the better ones you will find, as it offers plenty for low/medium stake players as well as the high rollers. Players collect coins for performing various actions on the site: logging in; playing a cash game; making a deposit; rating a game; recommending a friend and so on. As you collect more coins you move up the levels, and earn different badges and avatars as you go. Players also earn trophies for playing in tournaments and there are achievement awards too – all of these will keep you coming back to this entertaining online casino for more! There are also lots of great promotions and bonus offers available at Vera&John apart from the welcome package and Loyalty Plan, so there is more than enough here to keep existing players happy. The site is fully licenced and regulated by the Malta Gaming Authority, one of the most widely respected in the business. What this means is that all games are regularly scrutinized for fairness and that any money you deposit will be held securely. Deposits and withdrawals are available using Bitcoin, EcoPayz, Neteller, Skrill and bank wire transfers. For deposits only, the casino accepts credit/debit cards and paysafecards, but you would then need to use bank wire transfers to withdraw your funds. The withdrawal process is reported to be faster than most online casinos, so you won’t be kept waiting long for your funds. There is a superb collection of more than 400 slot games available at Vera&John from a list of fantastic providers which includes NetEnt, Yggdrasil, NYX, Microgaming, Thunder Kick, Betsoft Gaming, PLAY’nGO, Quickspin, Evolution Gaming, IGT, Williams Interactive and Leander Games. This casino likes to take care of mobile users too, so you will find lots of games and big jackpots available for those who enjoying playing while they are on the move. Some of the great video slot games available at this site include the following: Fruit vs Candy; Huangdi The Yellow Emperor; Dragonz; Troll Hunters; The Wild Chase; Wish Upon a Jackpot and hundreds more. And that’s not to mention some of the huge progressive jackpot games like Mega Moolah and Major Millions 5 Reel where you could win life changing sums on a single spin of the reels. An added bonus with Vera&John is that slot players get the chance to enter regularly scheduled tournaments to win cash prizes and bonuses, which adds to the fun of the slot gaming experience. There is not a huge selection of traditional table games in the main section of the site, but you will have the option to play your favourite games here – there just isn’t the variety of options you can find on other casinos. That being said, games of blackjack, roulette, baccarat, casino hold ‘em and pai gow poker are available and that will be enough for most casual table game fans. However, the good news is that Vera&John now have a great live dealer casino section, and here is where fans of classic casino games can really have some fun. There are some great live dealer options covering all your favourite table games beamed in from around the world, so plenty to enjoy for card and roulette fans here. Unfortunately, there is not much to speak of when it comes to alternative gaming options at Vera&John. Apart from a couple of games of video poker, you won’t find many other instant gaming options here, so will have to stick to the slots and table game options for the most part. Vera&John Casino has a great reputation for offering fast and friendly customer support, and generally they will be able to solve any issues you have quickly and efficiently. Office hours are from 09:00 to 01:00 CET when you can get in contact by live chat or by phone, and otherwise you can contact the casino via email or request a call-back from them. 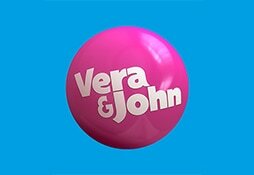 Vera&John Casino has one of the weirdest names you will find in the already weird and wacky world of online gaming, but don’t let that put you off from signing up with this imaginative site. The range of games is good, and the developers involved in providing slots games for this site dominate the market in terms of producing quality video slots.What makes Vera&John worth considering ahead of some of their competitors are the little extras that can make all the difference. For example the separation between your deposit and bonus funds may not seem like a big deal now, but if you have tried withdrawing winnings from a deposit bonus from other casinos you will understand why the Vera&John model is so good! Also the tournaments and innovative loyalty plan on offer here are major plus factors when you are considering which casino to join. In summary: dodgy name, great casino!